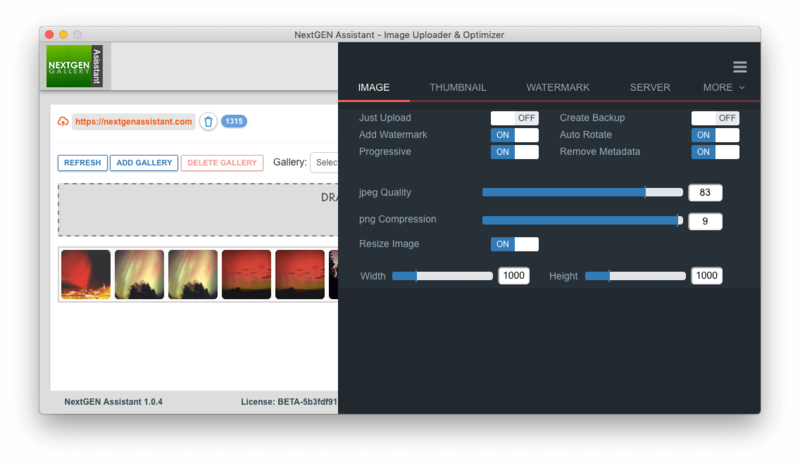 Blazing fast NextGEN Gallery image creation – up to 8-10 times faster (or more) than the NextGEN Gallery uploader while lowering server load. 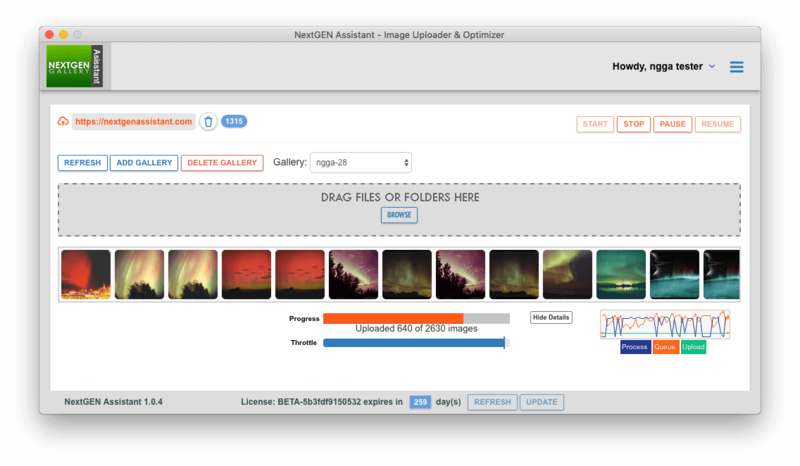 Move NextGEN image processing from the web server to your much more powerful desktop system. 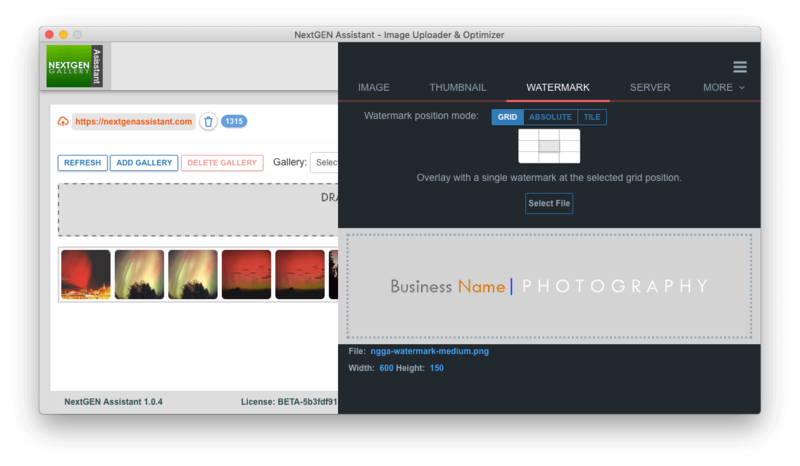 Optimize, resize, apply watermarks, and generate thumbnails before uploading images to the WordPress site. Let your desktop do the heavy image processing while freeing up limited WordPress server resources. Bypass the web server’s file size limits. File sizes are only limited to the amount of storage available on the web server. 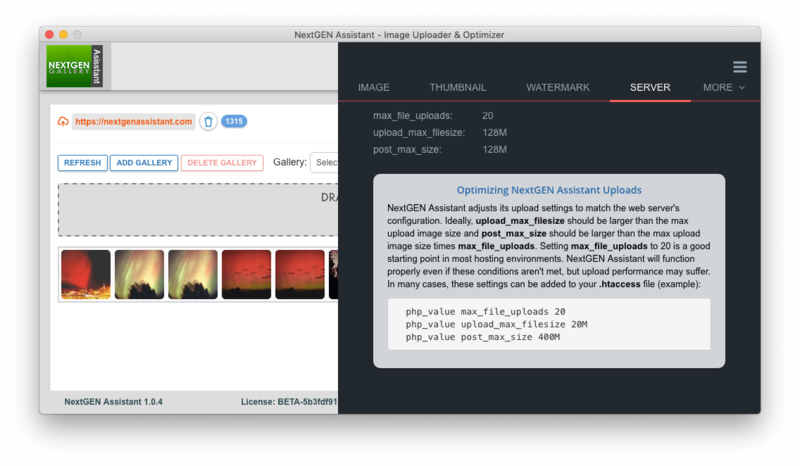 NextGEN Assistant can vastly reduce image upload time and web server cpu load. Some common gallery creation workloads and the resulting gains in performance and reduced server cpu load are detailed in the table. 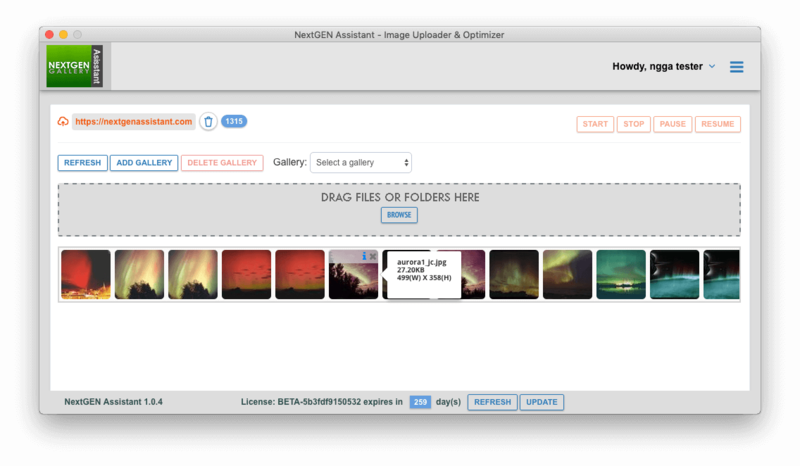 NextGEN Assistant provides a superset of NextGEN Gallery upload features that include several additional functionally and ease-of-use enhancements. See the table for a quick overview of these features. Download Two Week Free Trial Today! Download the zip file from this page. 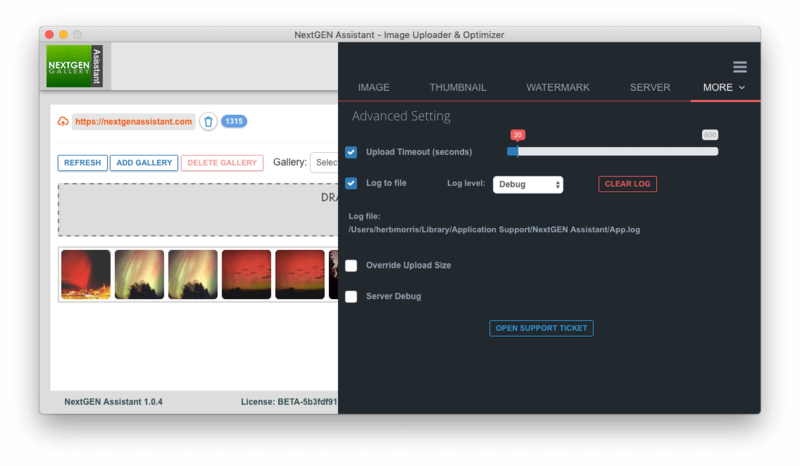 Upload it from the Plugins >> Add New > Upload page. You are granted non-exclusive limited license to use the NextGEN Assistant desktop program and the WordPress NextGEN Assistant plugin. A site license is active for 12 months from the time of activation. You may not share or resell your license key. 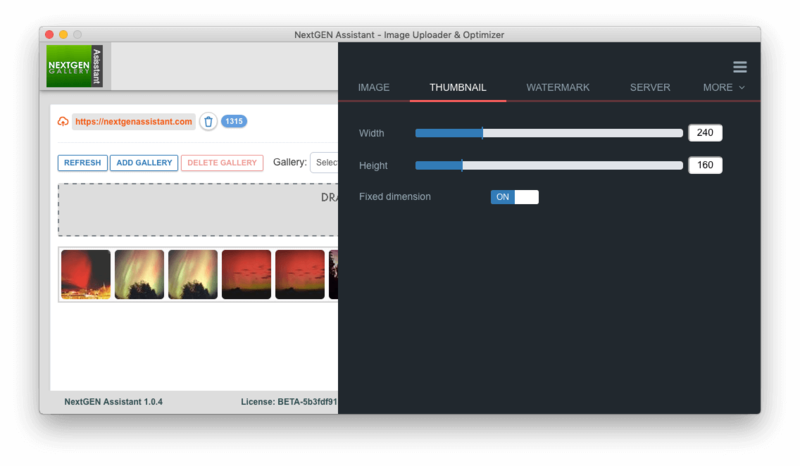 After 12 months the license will need to be renewed in order to continue using the NextGEN Assistant Desktop application. After we have successfully processed your payment, you will receive an email with the license key for a single WordPress site. You may not claim intellectual or exclusive ownership rights to any of our products. They are provided "as is" without warranty of any kind, expressed or implied. We shall not be liable for any damages, including but not limited to, direct, indirect, special, incidental or consequential damages or losses that occur out of the use or inability to use our products. No refunds are available. All sales are final. Please use the two week free trail period to evaluate NextGEN Assistant before making your purchase. 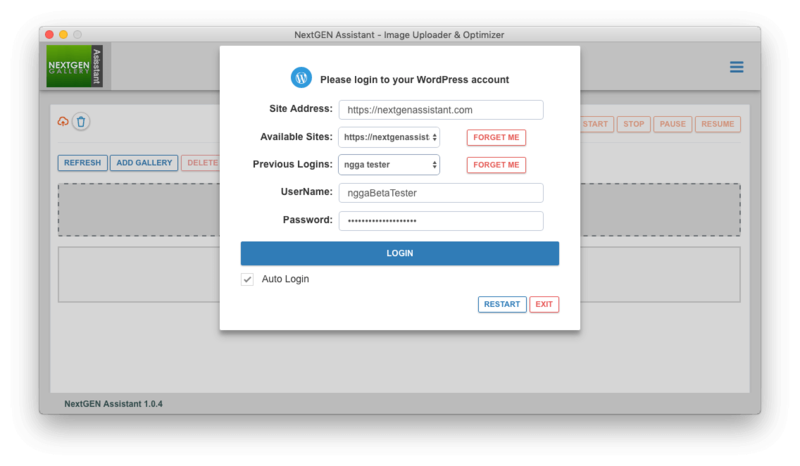 The NextGEN Assistant desktop appication and WordPress plugin are offered "as is" and with no implied meaning that they will function exactly as you would like or will be compatible with all 3rd party components and plugins. We do not offer support via email or otherwise support WordPress or other WordPress plugins we have not developed. Support is offered to customers with a valid NextGEN Assistant license key. Purchasing a license key gives you access to our support resources and documentation. Support and automatic product updates are provided for a term of 12 months from the time of activation. After 12 months the license will need to be renewed in order to continue receiving support and product updates. The license key and support account are registered to the email address of the original purchaser. The original purchaser (license holder) retains the rights to the license and account even if the account/key is renewed or upgraded by another party. Only the license holder is permitted to request support or access support resources. License holders cannot distribute, freely giveaway, or resell their license key. The license key is only transferable by contacting us and requesting an official transfer of the license to a new owner. The license is intended to be used on the license holders web site(s). Client site usage is permitted in situations where the license holder maintains an ongoing relationship with the client as a consultant. Providing NextGEN Assistant as a service or providing NextGEN Assistant as part of a web hosting solution does not constitute an ongoing client/consultant relationship under these terms. License holders are not permitted to re-post support forum content or documentation on any external websites, social media outlets, etc. Posting screen captures of this content is also prohibited. Violation will be grounds for immediate termination of the support license and all access to support content and product updates will be discontinued. We may on occasion send you email notifications related to your NextGEN Assistant license. These transactional emails may include notification of licensing changes, changes to our terms and conditions, license expiration notices and other transactional emails related to your purchase of NextGEN Assistant. By purchasing NextGEN Assistant you agree to receive these transactional emails. We reserves the right, at any time, to modify or discontinue, temporarily or permanently, a license with or without notice. If an account is suspended no refund will be granted. By using NextGEN Assistant you grant us permission to list and display applicable trademarked name(s) and logos for sites utilizing NextGEN Assistant on the NextGEN Assistant client roster. This permission does not extend beyond the display of the name or logo on the NextGEN Assistant client roster. Client has the right to revoke the license to use logo at any time in its sole discretion by submitting a request. OUR PLUGIN IS GUARANTEED TO FUNCTION ON A FRESH INSTALLATION OF WORDPRESS USING THE DEFAULT WORDPRESS THEME. WE DO NOT GUARANTEE IT WILL FUNCTION WITH ALL 3RD PARTY PLUGINS, THEMES OR WITH ALL WEB BROWSERS. WE ARE NOT RESPONSIBLE FOR ANY PLUGIN OR THEME COMPATIBILITY CONFLICTS THAT MAY OCCUR. IT IS OUR POLICY TO SUPPORT OUR PRODUCTS AS BEST WE CAN AND WE WILL PROVIDE SUPPORT FOR 3RD PARTY PLUGIN CONFLICTS AT OUR DISCRETION OR AS TIME ALLOWS. THE ENTIRE RISK AS TO THE QUALITY AND PERFORMANCE OF THE SOFTWARE IS BORNE BY LICENSEE. SHOULD THE SOFTWARE PROVE DEFECTIVE IN ANY RESPECT, LICENSEE AND NOT LICENSOR OR ITS SUPPLIERS OR RESELLERS ASSUMES THE ENTIRE COST OF ANY SERVICE AND REPAIR. THIS DISCLAIMER OF WARRANTY CONSTITUTES AN ESSENTIAL PART OF THIS AGREEMENT. NO USE OF THE SOFTWARE IS AUTHORIZED HEREUNDER EXCEPT UNDER THIS DISCLAIMER. TO THE MAXIMUM EXTENT PERMITTED BY APPLICABLE LAW, IN NO EVENT WILL LICENSOR OR ITS SUPPLIERS OR RESELLERS BE LIABLE FOR ANY INDIRECT, SPECIAL, INCIDENTAL OR CONSEQUENTIAL DAMAGES ARISING OUT OF THE USE OF OR INABILITY TO USE THE SOFTWARE, INCLUDING, WITHOUT LIMITATION, DAMAGES FOR LOSS OF GOODWILL, WORK STOPPAGE, COMPUTER FAILURE OR MALFUNCTION, OR ANY AND ALL OTHER COMMERCIAL DAMAGES OR LOSSES, EVEN IF ADVISED OF THE POSSIBILITY THEREOF, AND REGARDLESS OF THE LEGAL OR EQUITABLE THEORY (CONTRACT, TORT OR OTHERWISE) UPON WHICH THE CLAIM IS BASED. IN ANY CASE, LICENSOR'S ENTIRE LIABILITY UNDER ANY PROVISION OF THIS AGREEMENT SHALL NOT EXCEED IN THE AGGREGATE THE SUM OF THE FEES LICENSEE PAID FOR THIS LICENSE (IF ANY) AND FEES FOR SUPPORT OF THE PRODUCT RECEIVED BY US. UNDER A SEPARATE SUPPORT AGREEMENT (IF ANY), WITH THE EXCEPTION OF DEATH OR PERSONAL INJURY CAUSED BY THE NEGLIGENCE OF LICENSOR TO THE EXTENT APPLICABLE LAW PROHIBITS THE LIMITATION OF DAMAGES IN SUCH CASES. SOME JURISDICTIONS DO NOT ALLOW THE EXCLUSION OR LIMITATION OF INCIDENTAL OR CONSEQUENTIAL DAMAGES, SO THIS EXCLUSION AND LIMITATION MAY NOT BE APPLICABLE. ‘Quiazon Holdings INC.’ IS NOT RESPONSIBLE FOR ANY LIABILITY ARISING OUT OF CONTENT PROVIDED BY LICENSEE OR A THIRD PARTY THAT IS ACCESSED THROUGH THE PRODUCT AND/OR ANY MATERIAL LINKED THROUGH SUCH CONTENT. The preceding terms & conditions govern the sale of NextGEN Assistant between you the buyer and seller. By placing an order with us you acknowledge that you have read, understood, and agree with our terms & conditions. Please notify us prior to placing an order if you disagree with any of our terms & conditions. We reserve the right to alter these terms and conditions at any time for any reason.